The first word that Mary uttered was Jesus, after which she did not speak again for several months. In the tenth year of her age, Mary was urged by her parents to marry a young man by the name of Redshaw, who was distinguished both by his riches and his noble birth. 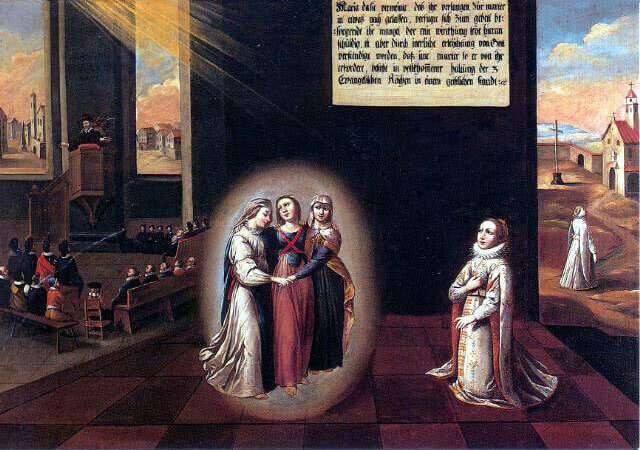 She prayed fervently to God, imploring Him to prevent this marriage, if it were not to His glory and for the good of her soul. Her prayer was heard. 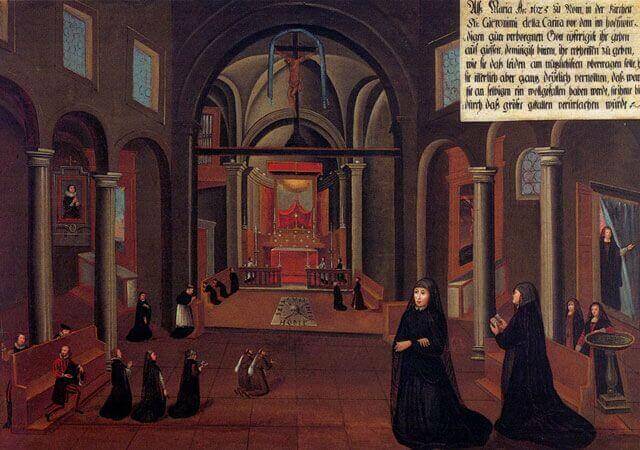 In the tenth year of her age, Mary had such a serious fall that she lost the power of speech. She thought within herself: Oh, how gladly would I die if only I could once say the saving Name of Jesus. As she pronounced it, she became quite well again and her heart was filled with such sweetness and love of God, that to the end of her life she never forgot it. 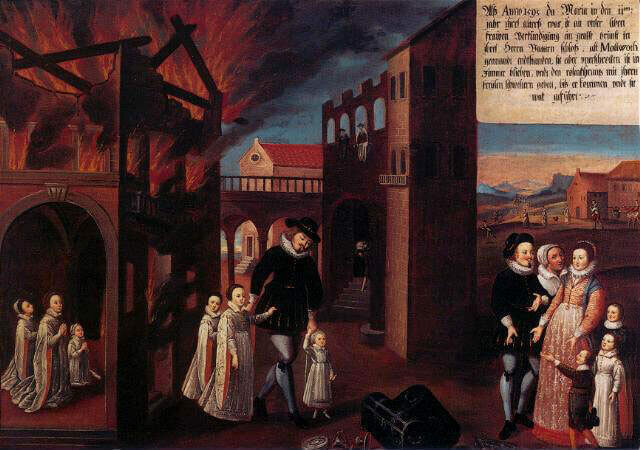 In the year 1595, when Mary was in her eleventh year, on the feast of the Annunciation, a great fire broke out at her father's mansion at Mulwith. 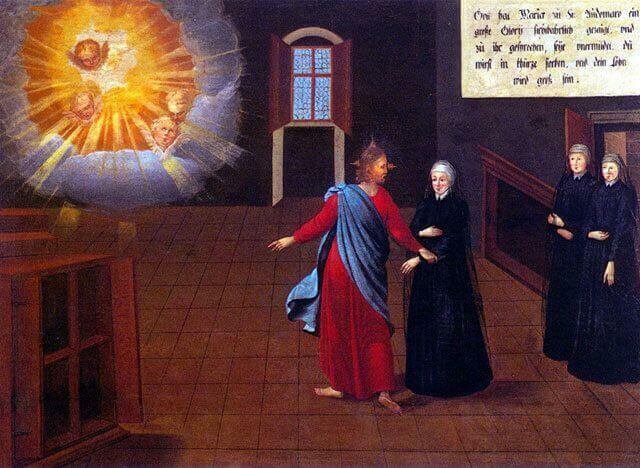 She was not alarmed, but remained in a room, saying the rosary with her sisters until their father came to fetch them. When Mary was in her twelfth year, she was again urged by her parents to accept a very suitable offer of marriage, from a gentleman but the name of Shafto. 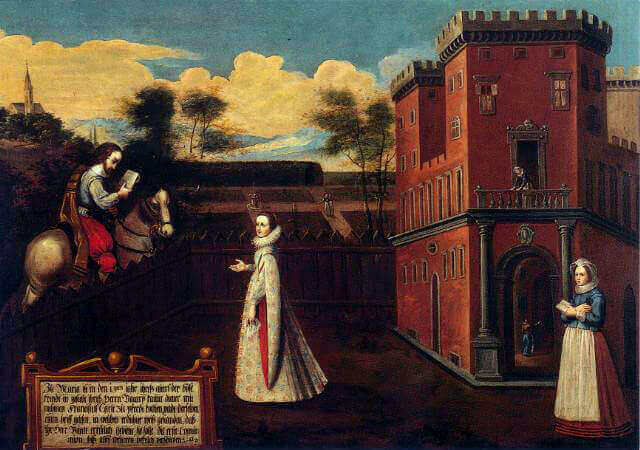 She insisted on refusing this proposal, esteeming that God alone was worthy of her love. 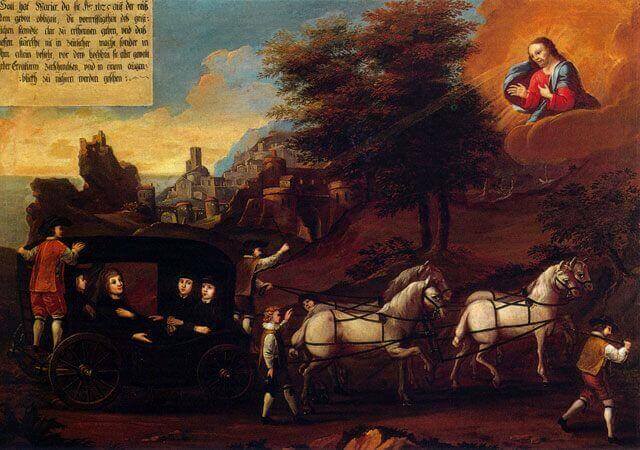 When Mary was thirteen, the devil came to her under the appearance of Francis Carle, her father's manservant. 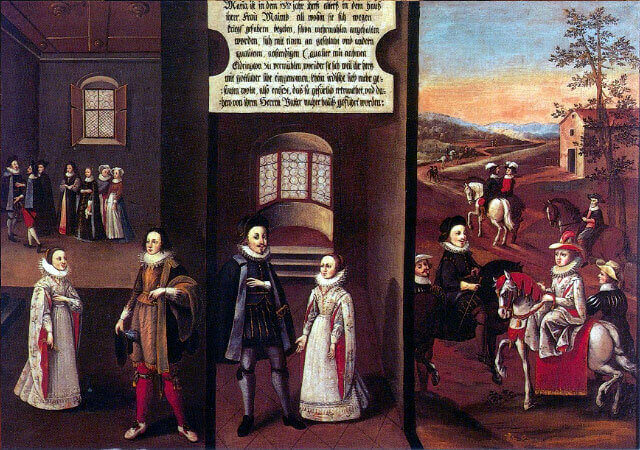 He was on horseback and read out a letter to her, supposed to be from her father and containing strict orders that she was to put off first communion until she received further instructions. In her thirteenth year, after overcoming many obstacles, Mary prepared with great zeal and devotion for her first communion, on which occasion she received much light and knowledge from God. When Mary was in her thirteenth year, on account of the war threatening to break out, she was sent to stay with a relative. 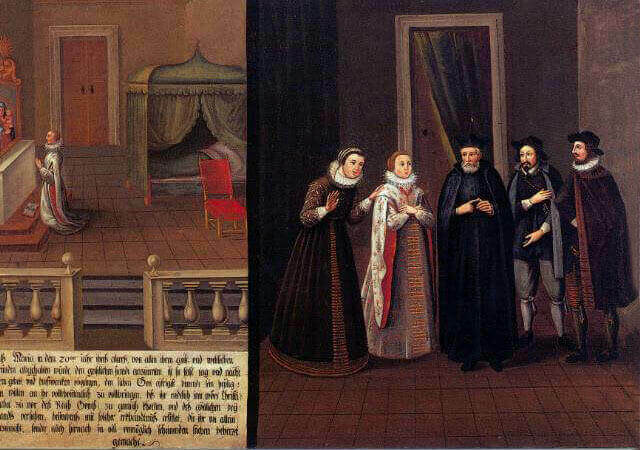 She was frequently urged to consent to a betrothal with a young gentleman named Eldrington, of distinguished birth and other eminent qualities. But her heart was so caught up in diving love that she could not consent to any earthly love. She was so afflicted at being pressed to marry that she fell dangerously ill and her father was obliged to fetch her home. 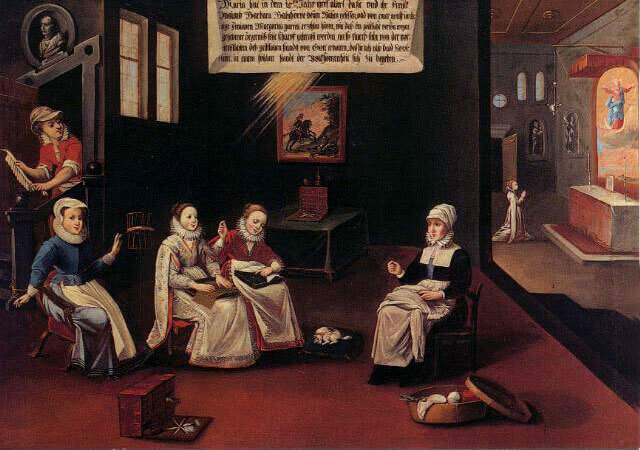 One day, when Mary was fifteen, she sat sewing with her cousin Barbara Babthorpe, while a devout workman, named Margaret Garrett, told them of the severe punishment inflicted on a religious whose conduct had given scandal. On hearing this story, Mary received so much light from God on the excellency of the religious life that she decided to embrace this state of perfection. 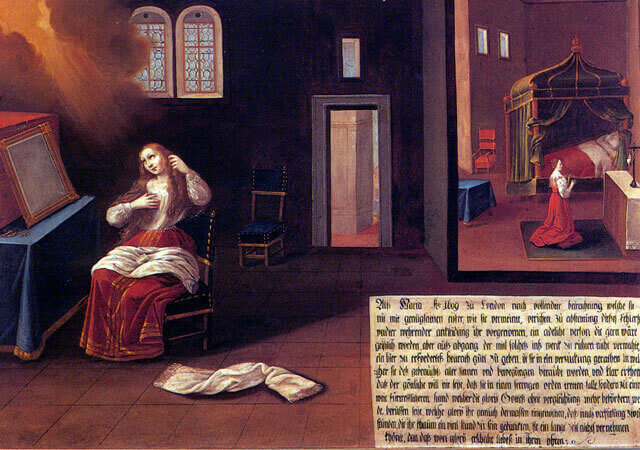 When Mary was sixteen and read the lives of the holy martyrs, she was seized with such a burning desire to follow their example that she felt only martyrdom itself could satisfy her longing, until our Saviour revealed to her interiorly that what He required of her was spiritual rather than bodily martyrdom. 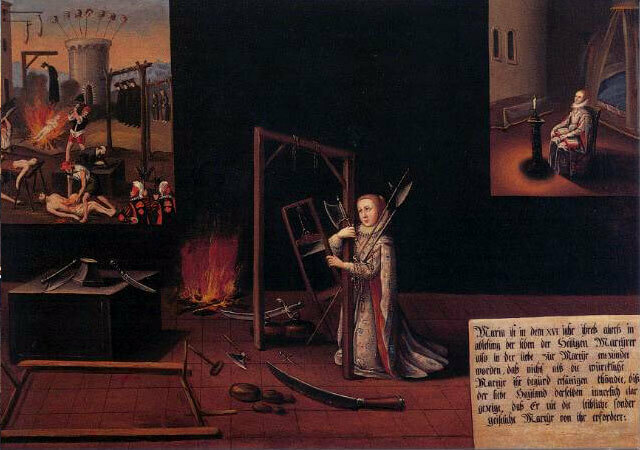 As Mary feared that her desire for martyrdom was somewhat diminishing, she betook herself to prayer lest any want of cooperation on her part should have caused this. 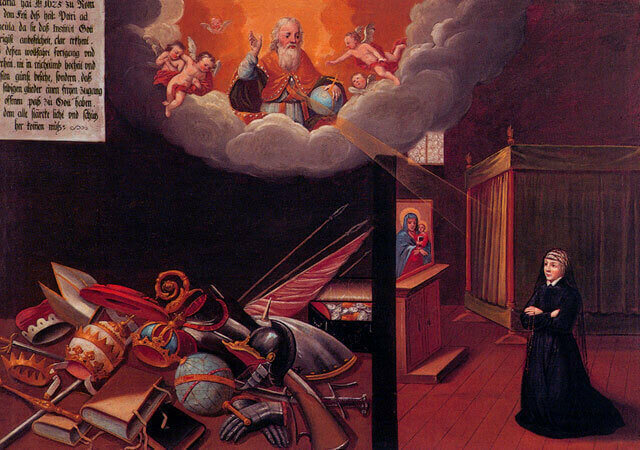 Then God revealed to her that the martyrdom He expected of her was to consist in the perfect observance of the three evangelical counsels in the religious state. When Mary was twenty, all her friends, both secular and religious, tried to disuade her from entering religion. 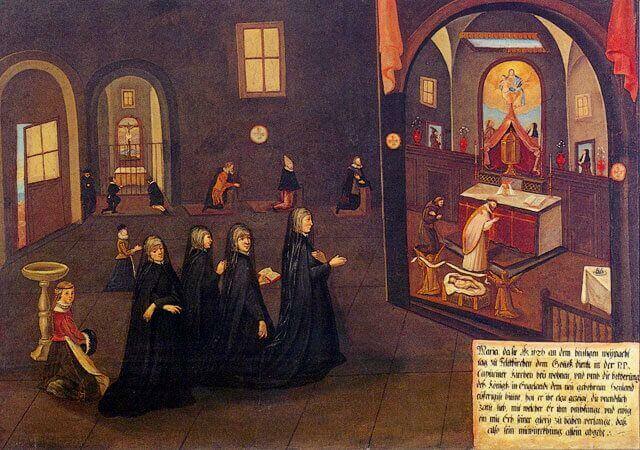 So she devoted herself almost day and night to prayer and penance, imploring God to accomplish His holy Will in her. At last Christ's words, "Seek ye first the kingdom of God" came to her mind, and she felt sure of God's assistance. She received such enlightenment that it gave her courage, not only then, but also subsequently to face seemingly unsurmountable difficulties. 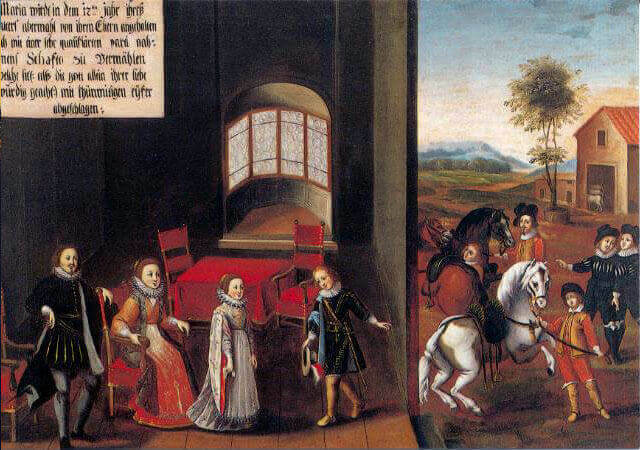 In 1606, in order to test her fidelity, Mary was urged not only by her parents but also by her confessor, to marry a young man named Neville, the sole heir of a very ancient and noble Westmoreland family. But she heroically obeyed the call of God and did not yield to human persuasion. 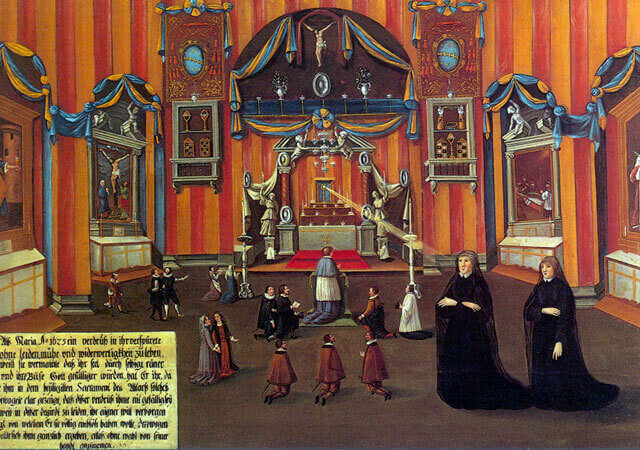 When Mary's confessor was saying Mass in London in 1606, it happened by divine permission that he inadvertently spilt the chalice. This wrought such a change in him that when Mary, after Mass, respectfully handed him a towel to dry his hands, he said to her with tears streaming from his eyes: "I will never more hinder your religious design, but further you all I can." And so it happened. 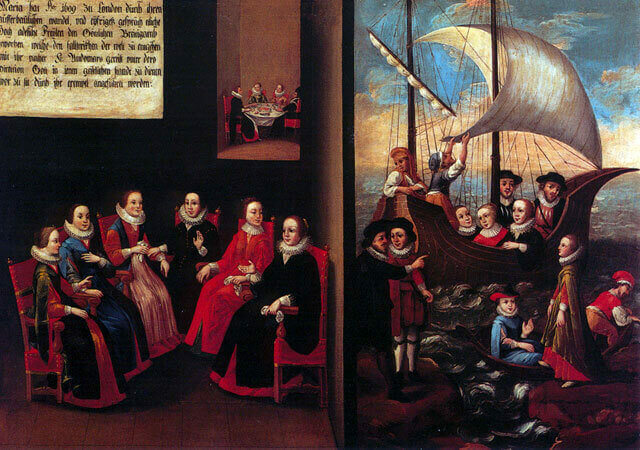 After Whisuntide in 1606, Mary being then 21, she left home with her confessor’s consent, and took ship to Saint-Omer accompanied by Mrs Bentley to whose care she had been entrusted. She was filled with unspeakable joy at being able at last to enter upon the religious state, having so long and so ardently desired it. 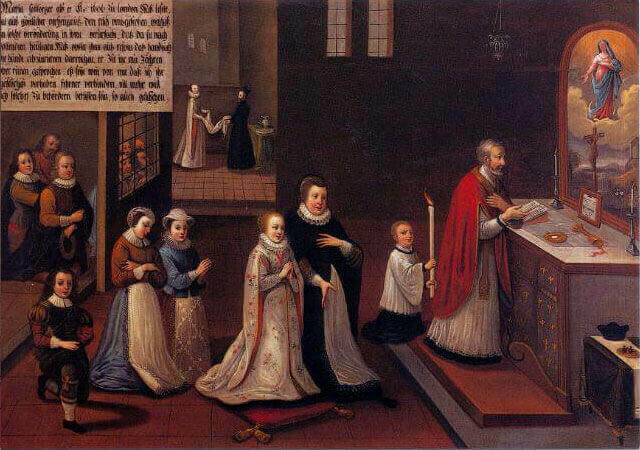 In 1609, when Mary was 24 years of age, with the approval of her confessor whom she had vowed to obey in all spiritual matters, she made a vow to return to England and to labour there for the salvation of souls, in conformity with her state. Her labours produced abundant fruit. 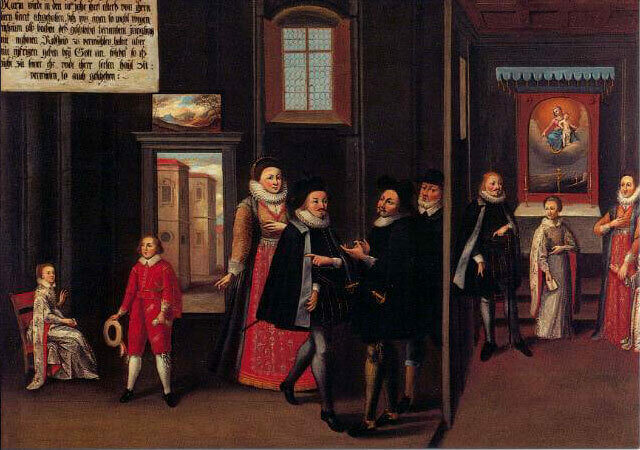 At Coldham Hall in England, Mary obtained the conversion of a very wealthy but obstinately heretical lady, after many learned men had vainly employed all their zeal and eloquence in trying to convert her. The touch of Mary’s hands and her friendly words effected such a change in this lady that she exclaimed: “I will be a Catholic, confess my sins, and do everything to show that my conversion is genuine.” This she most zealously fulfilled before she died. 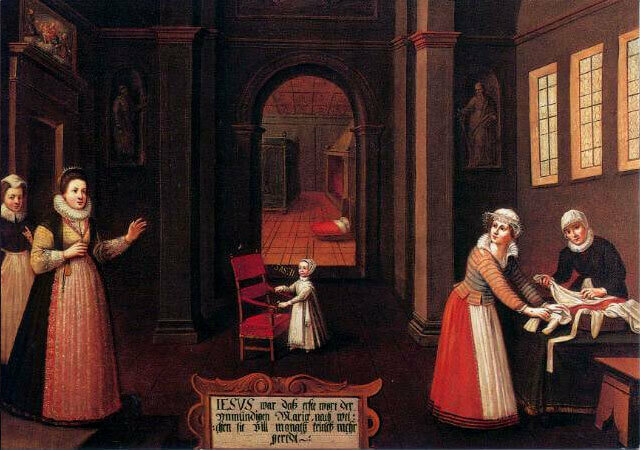 Mary’s great zeal for souls and ardent desire to bring her aunt Miss Gray to the Catholic faith, impelled her on one occasion to exchange her noble attire for the dress of her serving maid. Thus disguised she hoped to be more free to talk to her aunt in a prearranged house in London. While Mary was in London, her zealous words and gift of persuasion induced her aunt Miss Gray to talk to a priest of the Society of Jesus with a view to accepting the true faith. 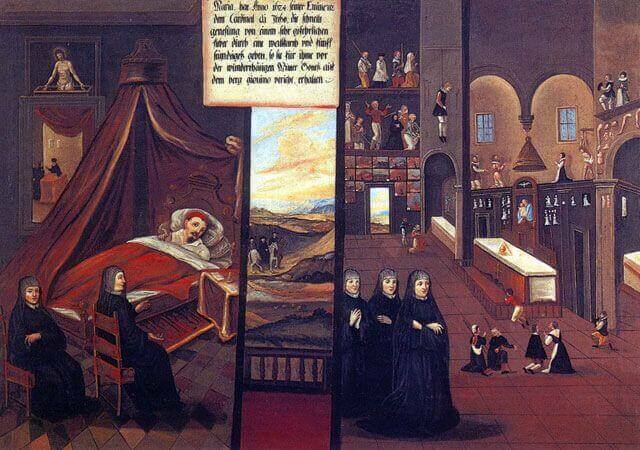 While there, Mary succeeded in bringing back to the faith on her deathbed and obstinate heretic who received the Holy Viaticum with great devotion. While Mary was in London, a noble gentleman sent his servants to her with a fine collation of dainty food. 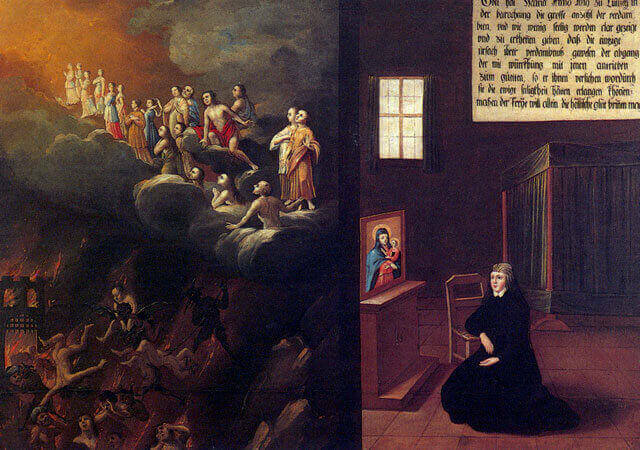 Mary feared, not without reason, that this might be a temptation from the evil one. So she locked herself in her room, and spent the whole night in prayer and penance. One morning in 1609, when Mary was in London, she had just made her meditation with, as she thought, very little fervour. 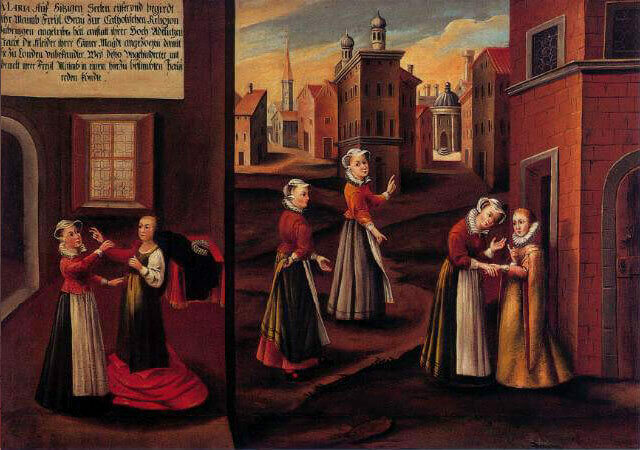 Whilst dressing, she determined to make amends for this by giving a large sum of money to a person of good birth who desired to enter religion, but had not the necessary dowry. 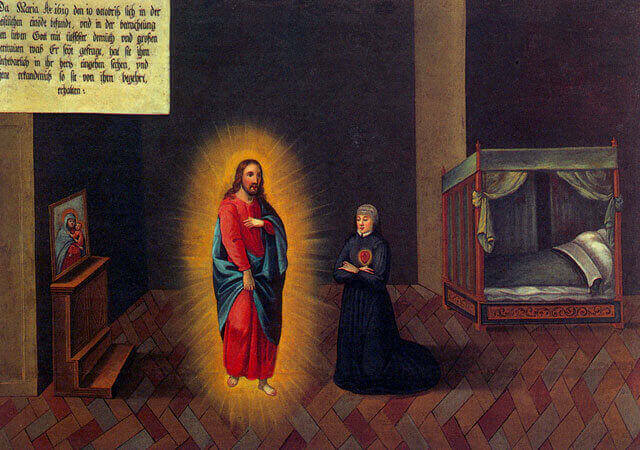 Mary thereby fell into an ecstasy which deprived her of her senses and her power of movement. 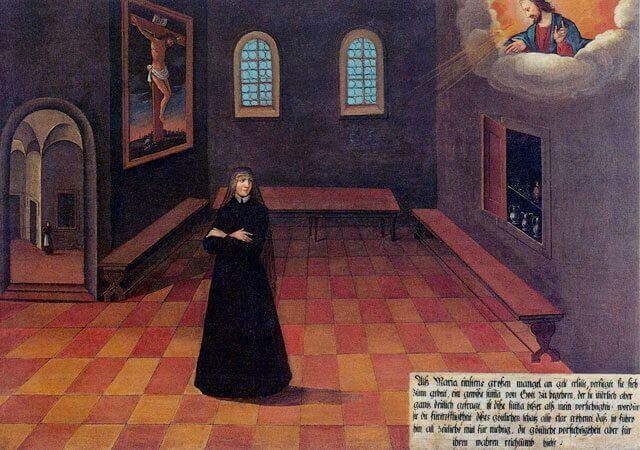 While in this state, she perceived clearly that it was not God’s will for her to enter an austere order, but that she was called to a much more excellent state which would do far more to promote the glory of God. After a space of two hours, which seemed to her like a quarter of an hour, a long time elapsed before she could hear anything except the word GLORY. 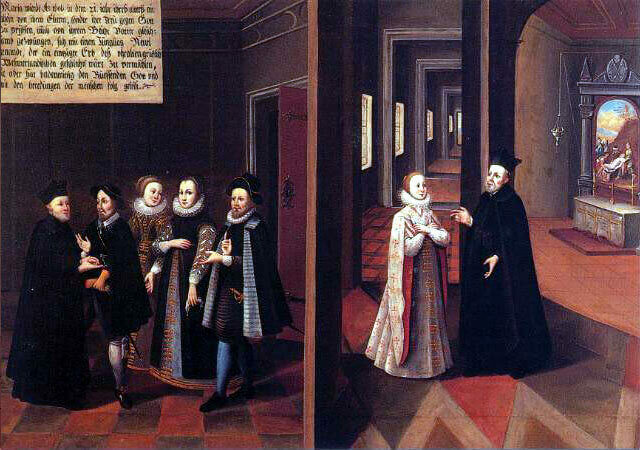 During her stay in London in 1609, Mary’s edifying life and persuasive words won over several young ladies of noble birth to the service of the Divine Spouse. Inspired by her example and to avoid the snares of the world, they crossed over with her to Saint-Omer, to serve God in the religious state under Mary’s direction. At Saint-Omer Mary feared she loved her confessor too much, so prostrate on the ground, she resolved to give him up and whatever else might in the least diminish in her the perfection of divine love. Then Christ appeared visibly to her and said, “O foolish child, it is not thou, but I who chose him for thee”, whereupon she felt entirely consoled and ceased to worry. 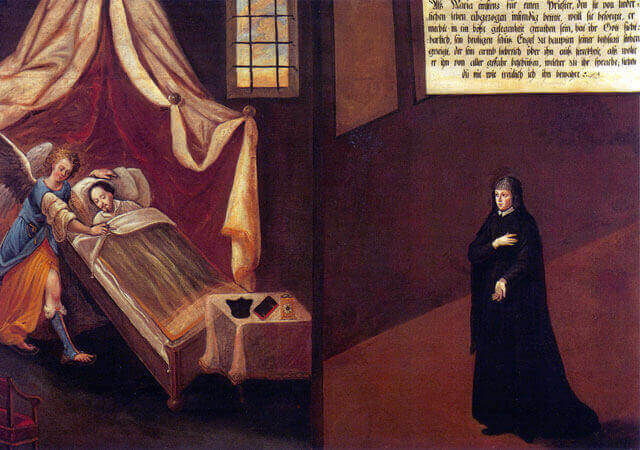 In 1611, as Mary, beginning to recover from a mortal illness, lay in bed at Saint-Omer, all alone and in an extraordinary repose of mind, she perceived quite plainly by an interior voice in what way she was to organise her Institute. This brought her so great light, consolation and strength, that it was impossible for her to doubt that this knowledge came from the divine Truth who is unable to deceive. 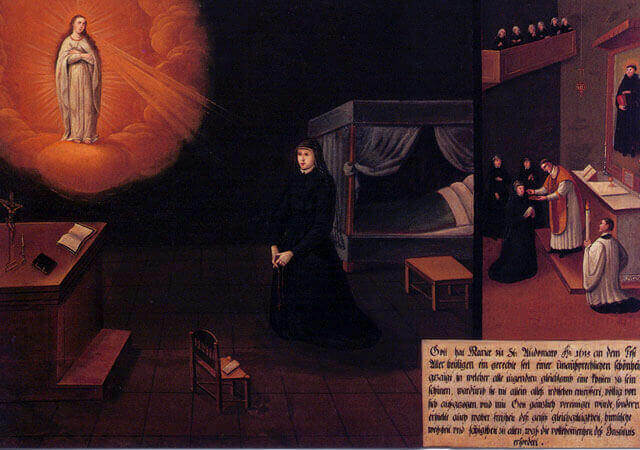 On the feast of All Saints in 1615, at Saint-Omer, God showed Mary a just soul in inexpressible beauty. All the virtues seemed to form in it, as it were a chain whereby it was not only cut off from everything earthly, but was perfectly detached from self and united with God. It also received true liberty of spirit, equanimity, heavenly wisdom and ability to accomplish whatever the perfection of the Institute required. 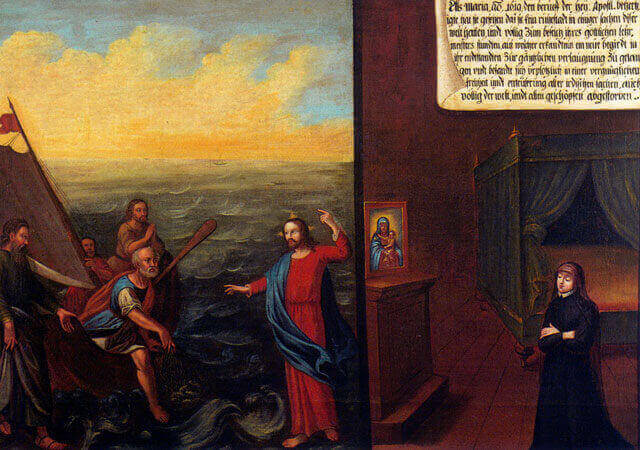 Mary was at sea on the feast of St James 1618, when she invoked this holy Apostle as her particular patron in order to quell a dangerous mutiny that had broken out on board. 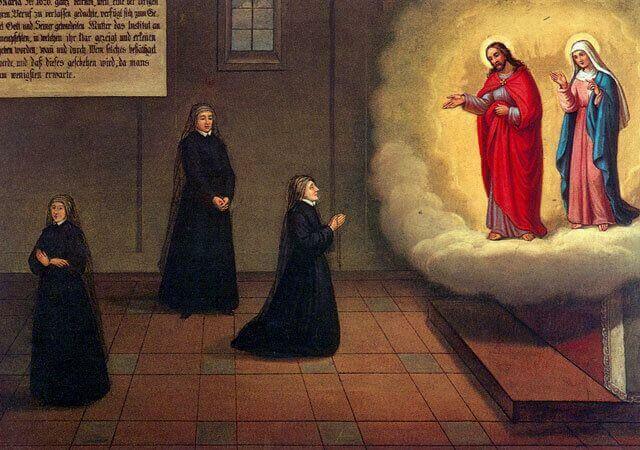 To the amazement of all, calm was restored and Mary afterwards declared that she had never sought any favour from God through the intercession of this great prince of heaven without it being granted to her. 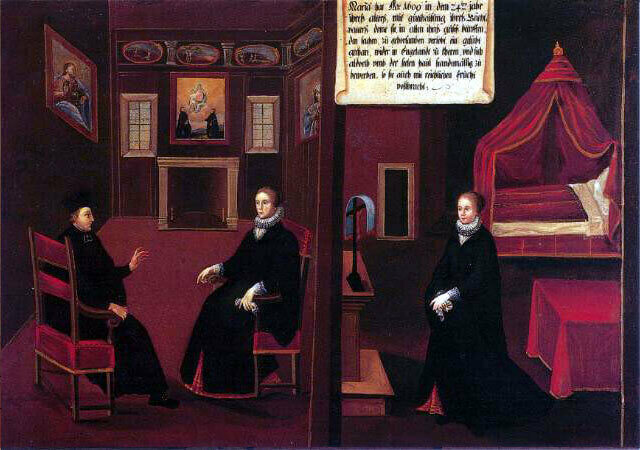 When in London, Mary was once meditating on the words, "AND THOU SHALT CALL HIS NAME JESUS"; God showed her visibly a just soul, adorned with great glory, and made her clearly understand that all who should live according to their vocation in this Institute, would attain to such unspeakable beauty of soul, for their state would bring them to great perfection and make them like to Christ their Lord, the most perfect model of all virtue. 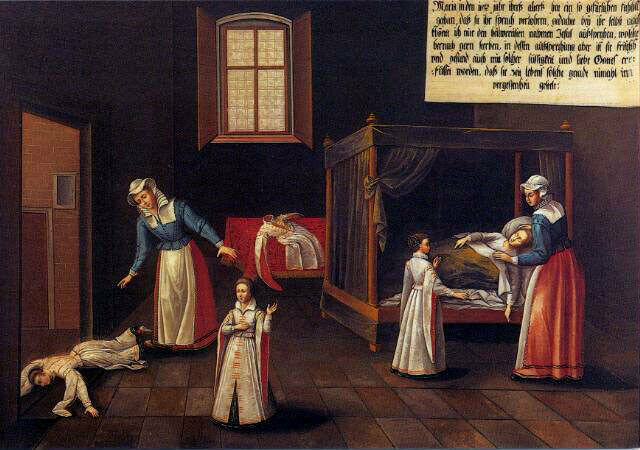 In 1618 Mary was grieving over her sins with many tears, when God clearly revealed to her that she was to make satisfaction for them in this life. Feeling God very near to her, she besought Him to show her how this might be done. Thereupon she perceived inwardly that it must be by bearing joyfully all the trials that would befall her in the accomplishment of His most holy Will. Mary was once praying earnestly for a priest whom she had rescued from an evil life; she feared lest he had again yielded to temptation, but God allowed her to see his guardian angel, standing at the head of his bed and with arms stretched lovingly over him as if to protect him from all dangers. The angel said to her: "Do you not see how faithfully I keep watch over him? 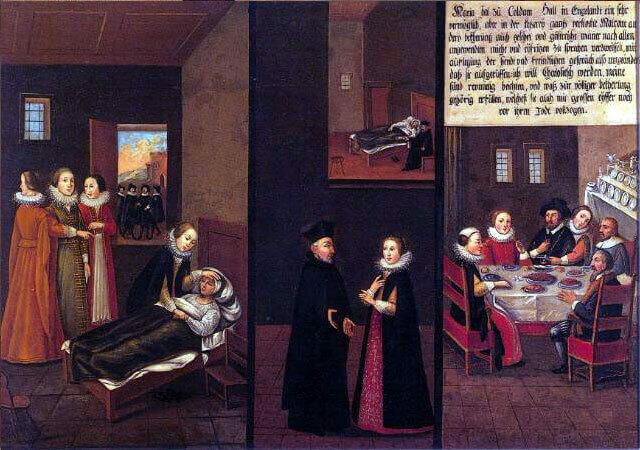 In 1619 at Saint-Omer, when Mary was fervently thanking God for the grace of her vocation, He showed her clearly that to help to save souls is a far greater gift than the monastic life or even than martyrdom itself. 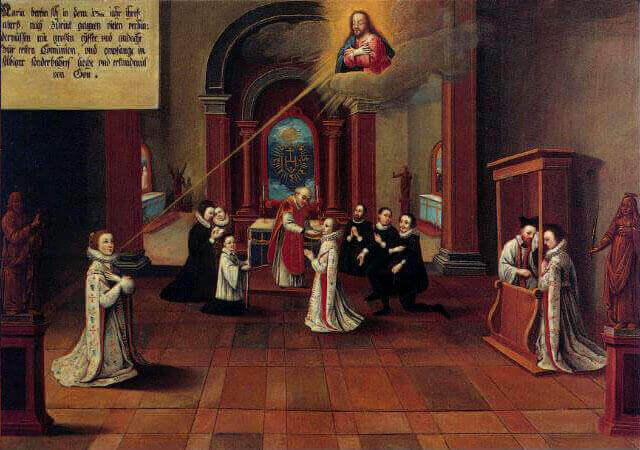 In 1619 when Mary was meditating on the call of the Apostles, she perceived that they had no resting place in anything of this world but were entirely at their Divine Master's disposal. This knowledge aroused in her a renewed desire to attain to perfect self-denial. Suddenly she experienced a feeling of complete liberty and detachment from earthly things, from the world and from created things. 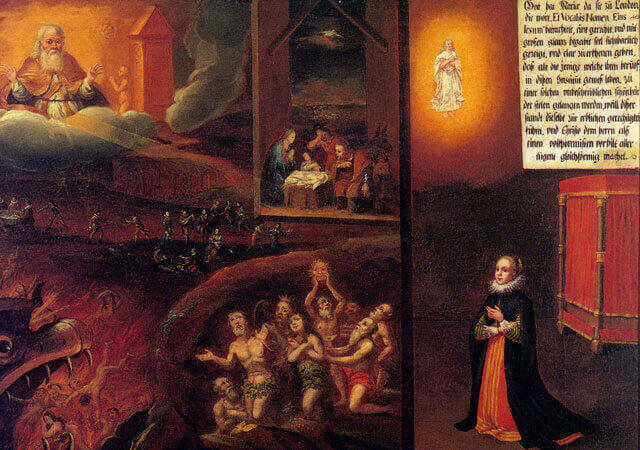 In 1619 Mary felt inwardly disturbed at living without sufferings, trials or apposition. She fancied these would purify her soul and render her works more pleasing to God. 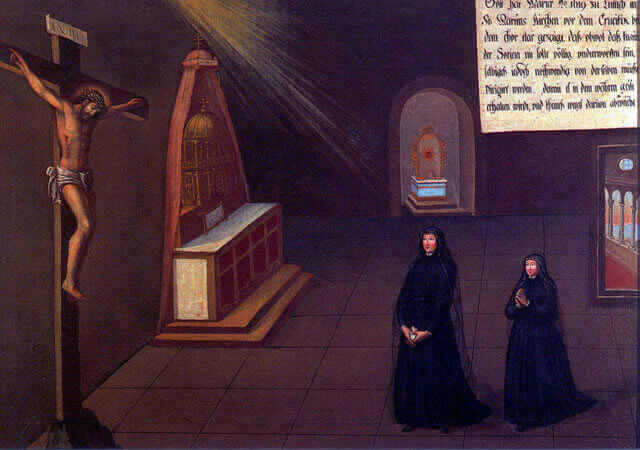 But when she laid these thoughts before Our Lord in the most Holy Sacrament of the altar, He showed her plainly that her distress on this account was not pleasing to Him because it came from self-will, which He wanted her completely detached from. She therefore desired to abandon herself totally to Him, and was ready to accept everything at His hand, just as it came. 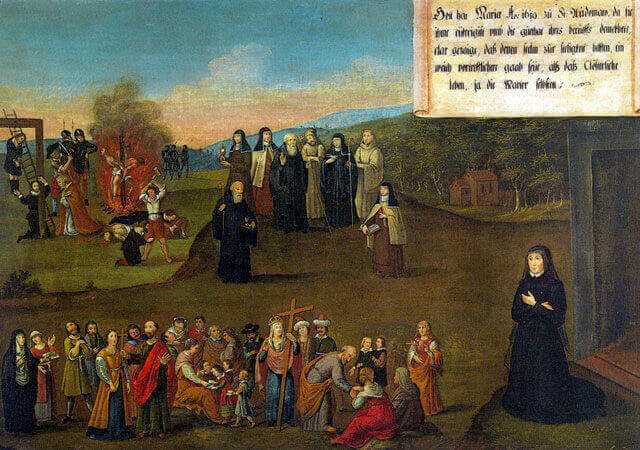 In 1619 at Liège, during her meditation, God showed Mary how many souls would be lost and how few saved; He also revealed to her that the sole reason for the loss of so many souls was that they had refused to correspond with the impulses to do good which He had given them, in order that they might attain to everlasting happiness. Their free will alone had condemned them to burn in hell. 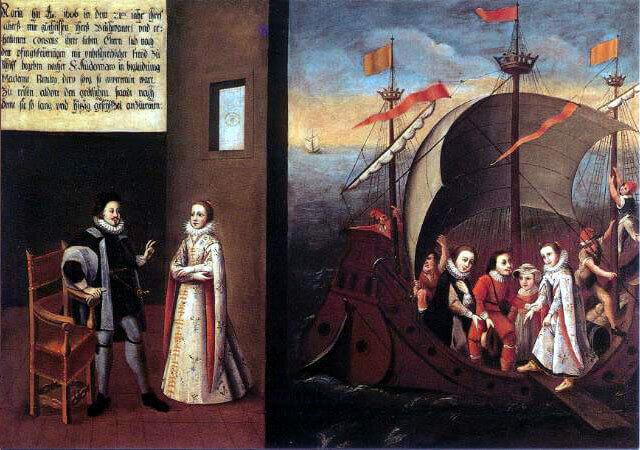 On October 10th 1619, when Mary was in retreat and besought God with fervour, humility and great confidence to make known to her what He really is, she saw Him enter into her heart and received the knowledge she had asked of him. 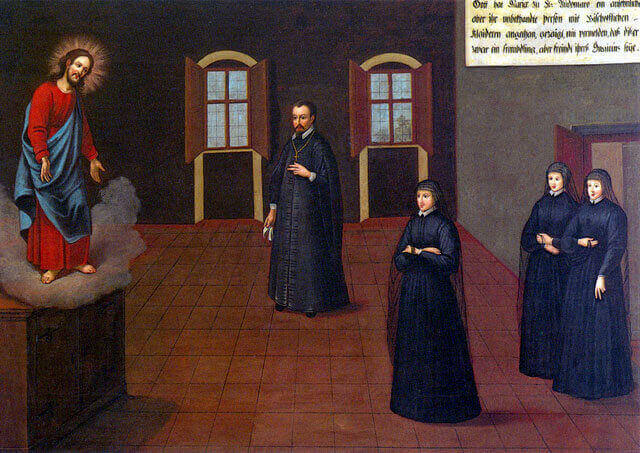 In 1619 in the Church of St Martin at Liège, before the crucifix near the sanctuary, God revealed to Mary that although the Institute was not to be altogether subject to the Society of Jesus, yet it ought to be under its direction, in order to preserve and not to deviate from its true spirit. 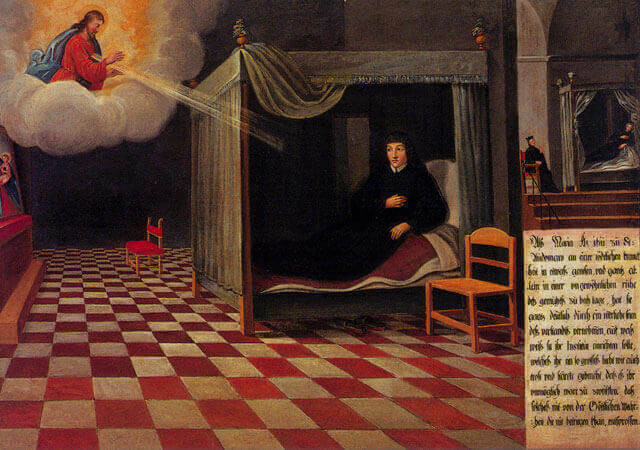 In 1624 Mary obtained a speedy recovery from illness for his Eminence, Cardinal Trescio. The favour was grated to her through a pilgrimage to the shrine of the miraculous Madonna on Monte Giovino where she spent five hours in prayer for the Cardinal. 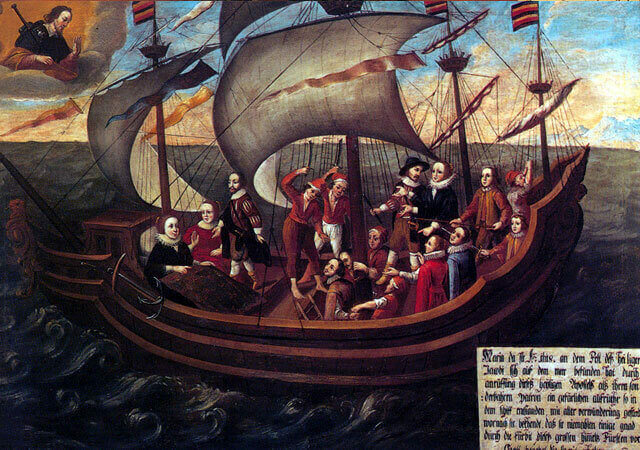 In 1625, whilst Mary was praying during a journey, God made known to her the excellence of the religious state, showing her clearly that its strength does not consist in any temporal power, but in God alone before whose greatness she beheld the might of all created beings to melt away and vanish. On the feast of Saint-Peter-in-chains 1625, in Rome, as Mary was fervently commending her Institute to God, He made known to her that its prosperity, progress and security did not depend upon wealth, dignity and the favour of princes, but that all its members had free and open access to Him from whom proceed all strength, light and protection. 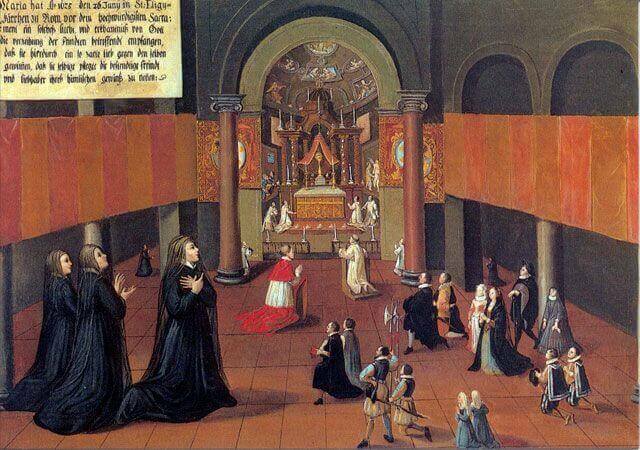 In 1625, in Rome, Mary prayed fervently to Our Lord hidden in the Blessed Sacrament in the Church of San Girólamo della Caritá. She most humbly implored God to teach her how her sufferings might be borne most profitably. She heard an interior voice, yet quite distinct, telling her that she would afford God the greatest pleasure if she bore her trials joyfully. 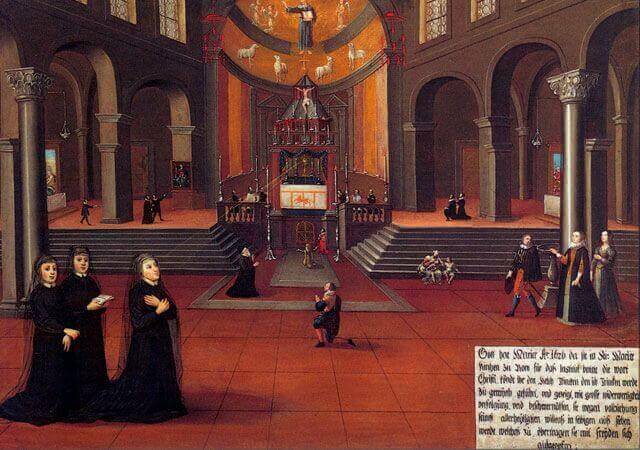 On April 11th 1625, Mary was in the Church of the Madonna dell'Orto in Rome, praying before the Blessed Sacrament, when she clearly perceived her own nothingness and saw that God was all in all. She became so completely wrapped in the love of God that she was taken out of herself and rested in Him alone. The intense brilliancy of the rays of light proceeding from the Blessed Sacrament shone on her face and deprived her for a while of her sight. 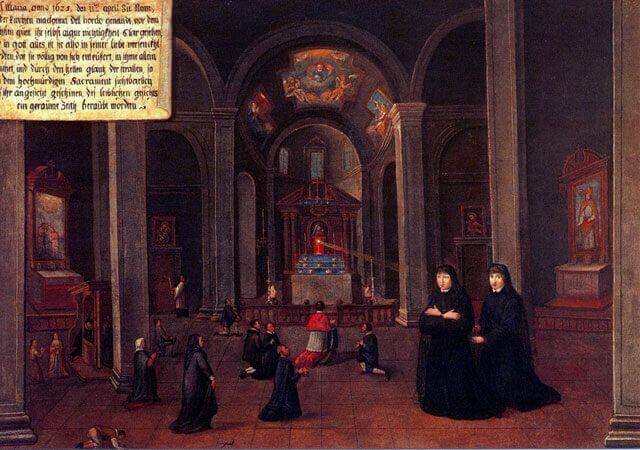 On June 26th 1625, Mary was praying before the Blessed Sacrament in the Church of S. Eligio in Rome, when she received from Our Lord so much light and knowledge regarding the forgiveness of enemies, that henceforth she cherished a tender affection for all who wronged her and was in the habit of calling them friends and lovers of her heavenly reward. 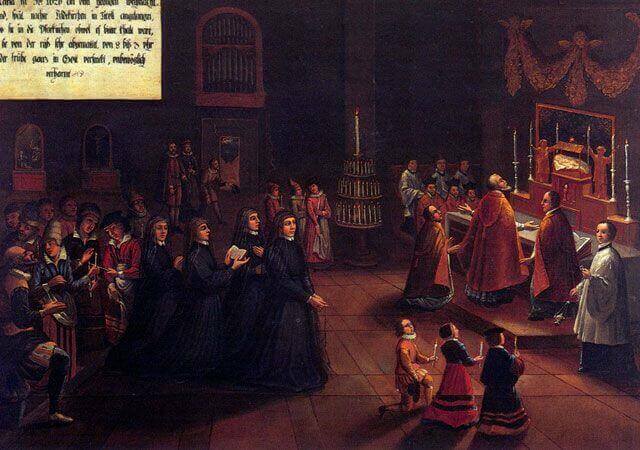 In the year 1626, when Mary was praying for the Institute in Saint Mark's Church in Rome, God reminded her interiorly of the words of Christ: "Can you drink the chalice that I shall drink? ", showing her what great adversities, persecutions and trials she would have to encounter in accomplishing His holy Will. She joyfully declared herself ready to accept everything. 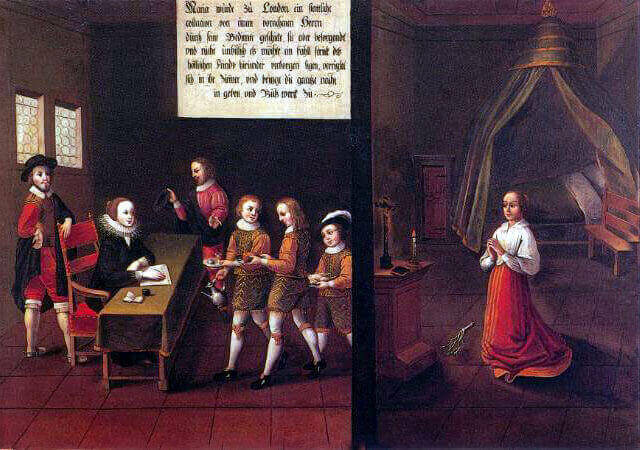 On Christmas Eve 1626 Mary arrived at Feldkirch in Tyrol; in spite of her fatigue and the intense cold, she remained in the Parish Church from eight o'clock in the evening until three o'clock in the morning, absorbed in prayer. 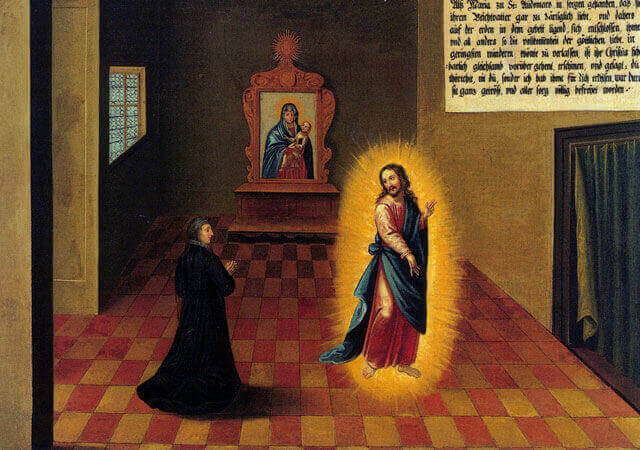 On Christmas Day 1626, Mary attended Mass in the Capuchin Church at Feldkirch and prayed most earnestly to the new-born Saviour for the conversion of the King of England. God revealed to her the infinitely tender love He had for the King and how much He desired him to share His eternal glory, but that the King's cooperation was wanting. 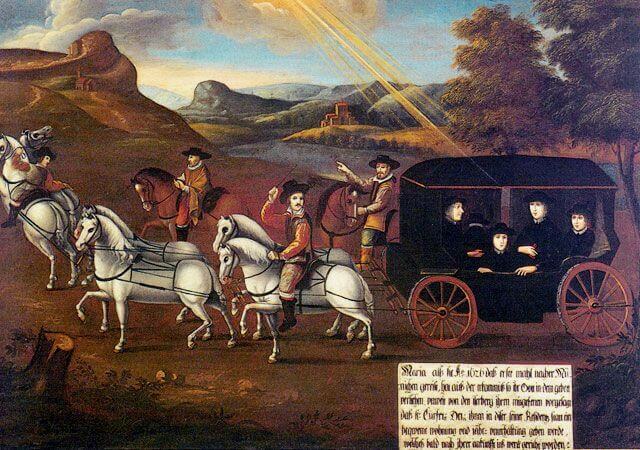 In 1626, when Mary was on her way to Munich for the first time, not far from the Isarberg she told her companions that God had revealed to her in prayer that His Highness the Elector would provide them with a suitable house and a yearly means of support. This effectively took place soon after their arrival in Munich. 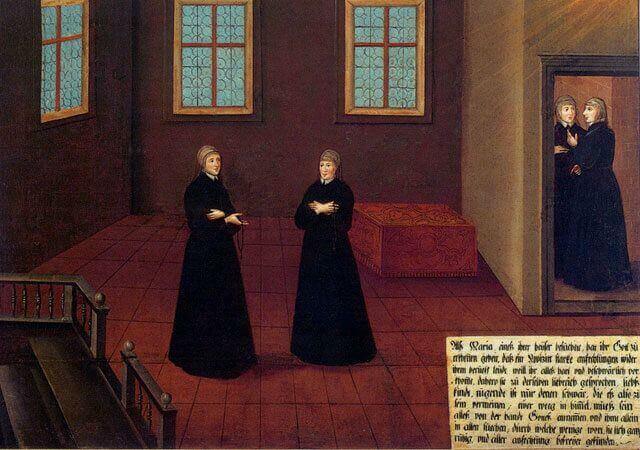 In 1626, Mary was once very sad because one of her companions was thinking of giving up her vocation. 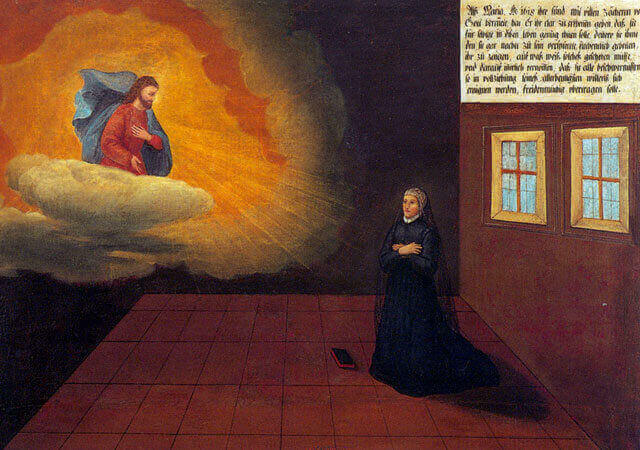 She had recourse to prayer, commending her Institute to God and His Blessed Mother. It was then clearly shown to her and she was given to discern when and by whom the Institute would be confirmed, and that this would be done at a time when least expected. Once, when Mary was in dire need, she had recourse to prayer, begging God to send her a certain sum of money. Then she heard clearly an interior voice asking her: "Is this sum of money better than my Providence?" From these words she perceived that henceforth she was to regard all worldly riches as unimportant, and Divine Providence as true wealth. When Mary was visiting one of her houses, God allowed her to perceive that one of the novices was suffering great temptations against her vocation, because everything appeared hard and wearisome to her. Mary spoke affectionately to her saying: "Dear child, virtue is hard only to those who consider it to be so; your way to heaven must be to accept everything from God's hand, and to seek Him alone in everything." In these few words the novice found peace and was delivered from all her temptations. When Mary was at Saint-Omer, God showed her a distinguished-looking man, unknown to her and dressed as a bishop. 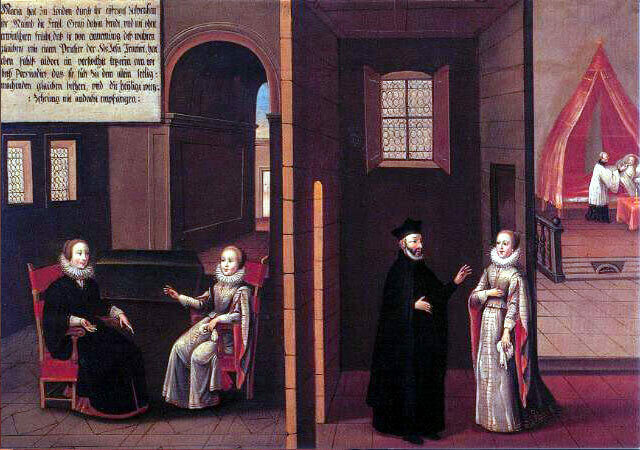 God revealed to her that this person, although a stranger was a friend of her Institute. At Saint-Omer, God granted Mary a sight of great glory, saying to her: "Be not weary, you shall die soon, and your reward shall be great."